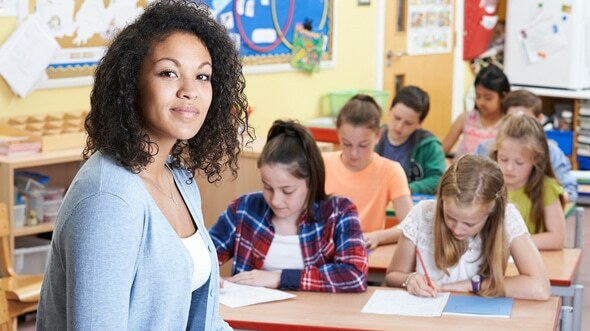 PrepForward provides online preparation courses to candidates practicing compositions for state teacher tests, including the MTEL Communication and Literacy Skills exam in MA. In this series, I’ll share the most common errors I see and tips for making a solid score on each performance characteristic. Spelling, punctuation, capitalization — these three areas are evaluated under the Mechanics trait on the MTEL Communications and Literacy Skills composition exercise. Let’s look at some strategies for earning a top rating in Mechanics. First, save time to proofread your composition. I believe that many mechanics errors are keyboarding errors. A purposeful proofreading with an eye for errors in mechanics could make a measurable difference on weak compositions. If your problem lies in keyboarding, sharpen your skills with a few hours of practice. Remember, you’ll be working without a grammar or spell check. As you write practice compositions, turn off any automatic computer proofreading helps. Write your paper. Turn the checkers back on, and see what gets flagged. Analyze your errors to find your weaknesses. Below, you can find a quick list of spelling, punctuation, and capitalization reminders. The list is not meant to be exhaustive. It’s intended to remind you of trouble spots so that you can research, practice, and perfect your Mechanics score on test day. Double the final consonant, drop the final e, change y to i—rules, rules, rules! Yes, multiple rules must be applied when adding suffixes to root words. The good news is that, with a few exceptions, the rules normally apply. Learn the rules; learn the exceptions; learn to apply the rules consistently. Double the final consonant for a one-syllable word ending in a single consonant, preceded by a single vowel (run, running; fat, fatter; shop, shopping). Double the final consonant for a multi-syllabic word that ends in a single consonant preceded by a single vowel when the last syllable is accented: control/controlled, but exit/ exited. Drop the final e when adding a suffix that begins with a vowel (drive/driving, use/usable). Keep the final e for words ending in ce or ge (courage/courageous, notice/noticeable) Keep the final e when adding a suffix that begins with a consonant (use/useful, rare/rarely). Change y to i when a word ends with a y preceded by a consonant (beauty/beautiful, happy/ happiness, but monkey/monkeys, chimney/chimneys). Keep the y before suffixes beginning with i (copy/copying). This spelling rule still works. So, you’ll write believe and achieve with i before e, and receive and neighbor with e before i.
Homophones sound the same but may be spelled differently. Their is possessive of they; there introduces sentences or clauses (There is/ There are); they’re is a contraction for they are. Weather is the condition in the atmosphere; whether is a conjunction introducing choices. Apostrophes for possessives. Apostrophes are used to change a noun to the possessive form. For example, the truck of the man is the man’s truck, the home of the Smiths is the Smiths’ home, and the coats of the children are the children’s coats. No apostrophes for regular plurals. Unless following the normal plural rule will lead to misreading, do not use an apostrophe to form a plural. A’s (on a report card) could easily be misread as As, so an apostrophe is needed. Otherwise, avoid apostrophes to form plurals. Apostrophes in contractions. The original use of an apostrophe was to indicate when letters had been left out. You will almost certainly write your composition in standard, formal English which will eliminate the use of contractions. Should you need to write speech in dialect, you can use an apostrophe. Do you feel like it’s impossible to keep up with hyphen rules? You might read three different sources and find three different spellings. So how do you know if it’s homeschool, home-school, or home school? Hyphen rules have some degree of flexibility. Here are a few general reminders. Nonessential elements. Commas can change the meaning of a sentence. Consider the difference between these two sentences. 1. The sixth graders, who tested late due to inclement weather, received their results in the summer. 2. The sixth graders who tested late due to inclement weather received their results in the summer. Of all aspects of the composition exercise, I would say that capitalization has the fewest distracting errors. Proofread for keyboarding errors, watch for proper adjectives (pre-Columbian discovery, Vietnamese food), and capitalize the full title of specific locations (Yellowstone National Park). Don’t be careless, but you should be okay on capitalization. You’ve probably been studying spelling, punctuation, and capitalization rules since your early elementary days. Now, you’re taking what could be the biggest test of your life, and they’re still haunting you. I suggest you review the most troublesome rules and give yourself time to proofread on test day. Be encouraged. Mechanics is the one characteristic where every candidate can achieve perfection.